The new office location will be 175 Western Parkway – Suite 400, Bedford, NS B4B 0G4. The College will be closed on Friday, April 19, 2019 and Monday April 22, 2019 for the Easter holiday. Regular office hours will resume on Tuesday, April 23, 2019. Pursuant to the Medical Act, a Hearing Committee of the College of Physicians and Surgeons of Nova Scotia will convene to consider allegations of professional misconduct and incompetence regarding Dr. Jacob Puthenparumpil. The Hearing will be held at the offices of McInnes Cooper, 13th Floor, Purdy’s Wharf, Tower II, 1300-1969 Upper Water Street, Halifax, commencing on April 23, 2019 at 0930 am and continuing thereafter as needed. The College of Physicians and Surgeons of Nova Scotia gave notice that as a result of two complaints and pursuant to the Nova Scotia Medical Act, Dr. Samuel Chun entered into a Settlement Agreement March 11th, 2019 with reasons to follow. The Hearing Committee’s reasons for its decision are now available. The College of Physicians and Surgeons of Nova Scotia hereby gives notice that as a result of two complaints and pursuant to the Nova Scotia Medical Act, Dr. Samuel Chun has entered into a Settlement Agreement in which he agreed to a reprimand and a one month suspension. A Hearing Committee approved the Settlement Agreement at a hearing on March 11, 2019. The Hearing Committee agreed that the Settlement Agreement is in the best interests of the public and the profession with full reasons to follow. Dr. Chun’s suspension begins on March 18, 2019. The College gives notice of a Settlement Agreement reached between the College and Dr. Juan Rivas, approved by the Hearing Committee of the College. The Hearing Committee orally approved the Settlement Agreement, with an agreed upon amendment, on January 18, 2019 and issued its written decision on February 5, 2019. The Settlement Agreement results in a three month suspension for Dr. Rivas. This suspension began on January 18, 2019. The written decision of the Hearing Committee with reasons for the approval of the Settlement Agreement is provided below. Licensing Statistics as of Aug. 31, 2018. 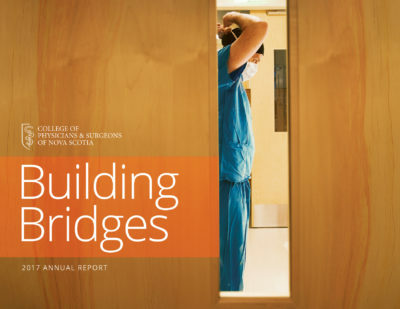 The College of Physicians and Surgeons of Nova Scotia serves the public by regulating the province’s medical profession in accordance with the Nova Scotia Medical Act and its regulations. All physicians in Nova Scotia must be licensed by the College in order to practise medicine in the province.